I found myself riding on a swift, black snowmobile to America’s largest and most popular national park, Yellowstone. After two hours of driving, my family and I were all excited about coming to Yellowstone park because we could ride our snowmobiles inside the park with a guide telling us facts. I was thrilled about going there because I had heard a lot about this great park from our neighbors and friends back home in Newport Beach. The first place we stopped at, with our snowmobiles, was a tall wooden sign with snow all over it that read, “You are Entering Yellowstone National Park“ and then drove into the park with the ranger’s permission. Immediately, I realized one thing; this preserved land was filled with wildlife and Mother Nature. The first thing I spotted was the appealing Madison River with its rushing waters and wide bed yet shallow depth. Big white swan come to this year-round river and eat trout while going upstream. The second thing I saw was Fire Hole Lake: where a small loud waterfall next to a snowy mountain, filled with trees, had bubbles on its surface from dried up lava. When we got back onto the road, I saw lots of big, shaggy, brown buffalos, which were halfway buried in the snow and being trailed by a coyote. One hour later, we parked our snowmobile near Old Faithful (the most famous geyser in Yellowstone) and walked on a short stone path to see it erupt at exactly 1:10. As soon as I looked onto the field, I spotted it: A big, gray, bubbly, hot, vapor-filled land formation. How did I know it was hot? Because there was no snow around it for thirty feet (the snow that was not effected was four feet deep in the park). 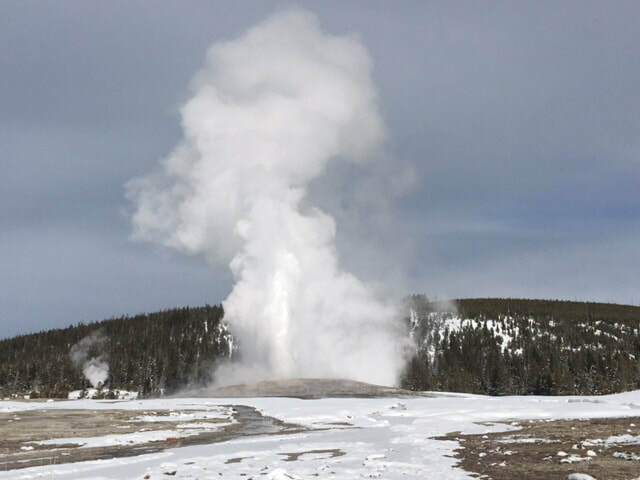 There was thick vapor all around the geyser high in the air; I knew that it would explode any minute. But it didn’t. It kept on shooting water low in the air, as if trying to reach the sun with water, many times. It kept us very attentive. Eventually, it exploded, and a thick stream of water shot out high in the air, about sixty-feet, and kept on shooting out water like a fountain for about three minutes. We got back to our snowmobiles all amazed at what we saw, when our guide said we would be visiting Sapphire Lake and mud pots, which would take about an hour to get to. We got off our roaring snowmobiles’ excited to see what Sapphire Lake was and everything around it. As soon as we entered the area we saw beautiful sights, petrified trees, geysers, mountains, and murky ponds. The guide said that the dirty water in the ponds were hot (190 degrees Fahrenheit), because of magma (lava that hasn't reached the surface) only being a mile from the crust of earth, and very acidic (2 on the PH scale, which is the same as stomach acid). He told stories about these ponds, which were very sad since they often ended in somebody getting hurt or dying. 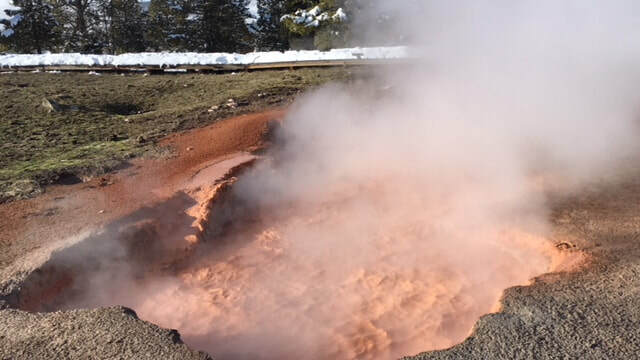 When I walked past the tiny geysers in the area, it unleashed a huge amount of vapor and a very sulfuric smell (like being in a room with a rotten egg). But, the best part about the tiny area was Sapphire Lake. It was a light-blue lake with clear water, which looked welcoming, but it was dangerous because of the heat! I learned that the beautiful lake was the main reason why people die in Yellowstone (visitors who don’t follow the rules fall in and other people die trying to save them). We got back to the road and drove to the mud pots. When we arrived, I saw small holes in the ground that were filled with toxic liquid which was orange and bubbled in different areas. The guide told us it got its color from iron, and it bubbled because of the chemicals inside that were constantly breaking each other down. 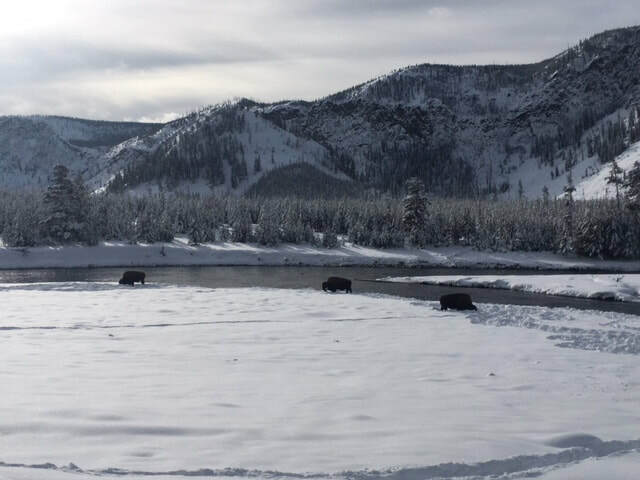 After this, the guide said it was time to go, so we got back to our snowmobiles and rode to the gate of Yellowstone enjoying the scenic views and wildlife on our way. When we returned to the rental facility we took off our helmets, returned our snowmobiles, took off our rubber boots, and weather resistant clothes. We said thank you to our guide and set off to our car, trying to preserve the pictures and memories of Yellowstone in our mind, to prepare us for the two-hour drive home and to tell our friends. 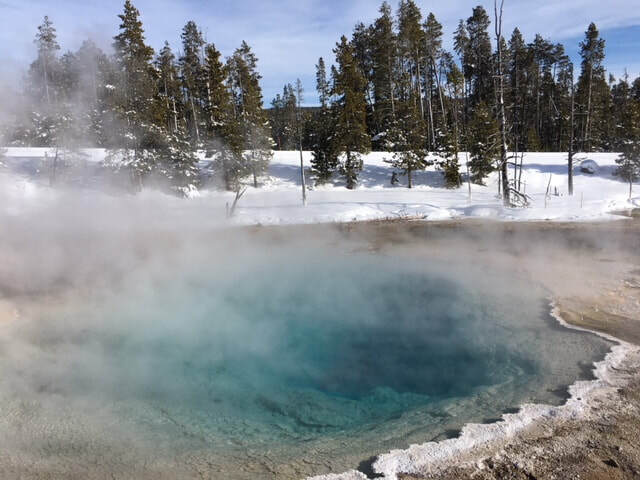 I think everyone should go and visit yellowstone, especially in the winter and drive snowmobiles with a guide because they can make the trip faster, more fun, and provides a personal “hands-on”connection with nature. Cyrus Villa is 10 years old and lives in Newport Beach California with his mom, dad, sister and dog. He is homeschooled and his favorite hobbies are writing poems, playing with his dog, and traveling.